What options can I set for shipping? You can add multiple shipping options, giving your customers the option to choose. For example an express option that has faster delivery, but is also more expensive. When you add a shipping option you can choose between a flat rate and a weight based rate. Which option is best for your shop depends on the products you sell, and the shipping options you want to offer your customers. 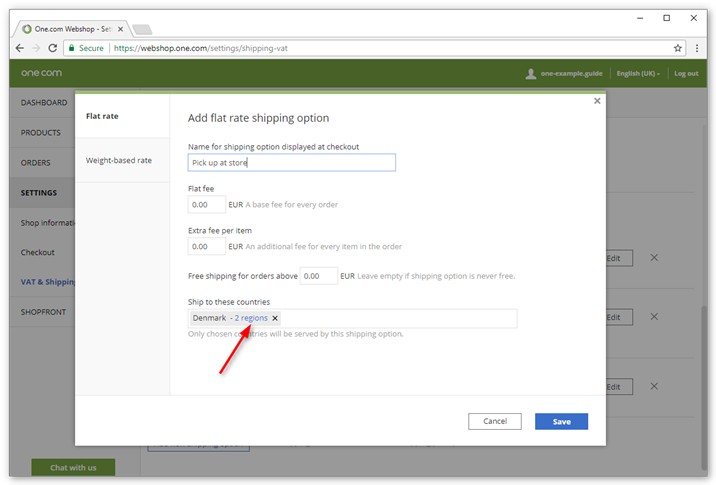 When you create a shipping option, you need to select to which countries you want to ship. For the most common countries, you can also select specific regions, instead of shipping to the whole country. If you want to set different prices per country, then you can create a shipping option per country. Which shipping option is available to your customers, depends on the address details they have entered at checkout. Tip! Give customers the option to collect items at your local shop. Add a new shipping option and name it "Pick up at shop", or something similar. Set the shipping fee to zero and choose for which country and region this option is available. A flat rate has the same price for shipping regardless of weight. You need to specify a base fee and an extra fee for each additional item. Log in to your One.com control panel and click Online Shop. 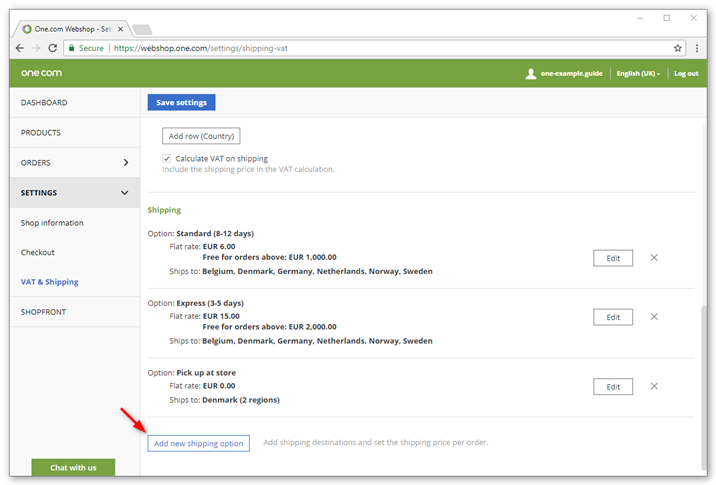 Click Settings and VAT & Shipping. Under Shipping, click Add new shipping option. Add a name for the option, for example Express or Premium. This will be displayed to the customer at checkout to choose from. For Flat fee you need to enter the base fee that will be charged for each order. Enter an additional fee under Extra fee per item. This will be added for each additional item. Type the amount above which shipping should be free. Leave the field empty if shipping is never free. Enter the countries to where you want to ship. Start by typing a country name and then select one of the available suggestions. Click Save settings in the top left corner. Tip: For the most common destinations, you can also select specific regions, instead of shipping to the whole country. This can be handy, if you for example have a flower shop, and you only want to deliver goods nearby. A weight based rate changes according to the weight of a product. This can be useful because postal and shipping companies base their rates on the weight of the package. Set the weight ranges, for example 0 - 5kg. Click Add range if you want to add more. The first range always starts with 0 and the last one always ends with infinity. Enter a fee for each weight range. 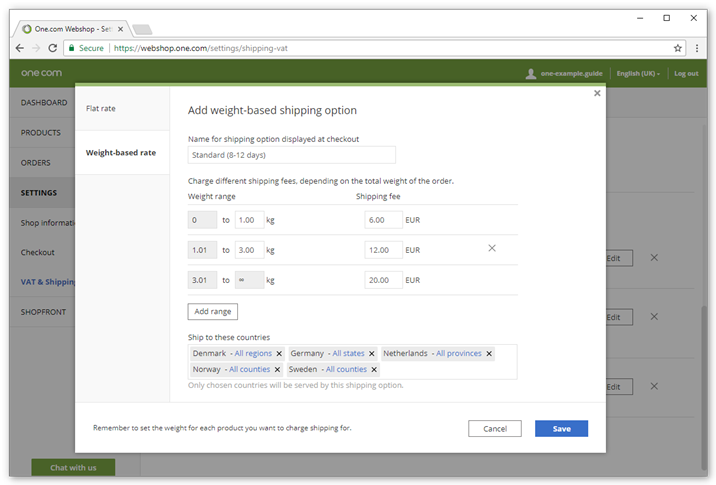 Note: Remember to enter the weight for each product, if you want to offer your customers weight-based shipping. How can I keep track of my stock?